Jump on board the biggest indie production going on in the world: the election of Barack Obama. I challenge everyone in the NYC indie theater scene to head down to Philly to do some canvassing. The show opens in 3 weeks and we want the reviews to be positive. Yes the pre-show word of mouth is good but we can’t get too cocky. McCain pulled out of Michigan. He gave that up to focus on battleground states like PA. Obama must take Philadelphia and Pittsburgh by wide margins to turn the center of the state blue. The registration period is over but the work is NOT done. I’ve been down twice to work in the 19th Ward under the supervision of Andrea Perez, who has come up from Puerto Rico to make this happen. You get a real feel for what’s up going there. A lot of underprivileged people are voting Red because they are scared or they feel Republicans should clean up the mess they’ve started. Also the nasty smear campaigning and character assassination by their operatives and volunteers is rampant. They call people and tell them they will be arrested if they have outstanding warrants or even parking tickets and try to go to the polls. They call with automatic messages asking them to press #1 to vote for Obama. Then it tells them they don’t need to go to the polls because they have already voted over the phone. It’s sick and it’s real. Rove works in mysterious ways. What can you do? Go any day of the week. A real person at their door can make a big difference. Big canvassing happens on Saturdays and Sundays 11am to 6pm. Contact Andrea Perez at 267-975-7211 or APerez@PAforChange.com. She works out of a little converted tax office in North Philly at 1804 E. Alleghany Ave. You can take NJ Transit to Trenton to SEPTA trains (that will take about 4 hours each way), Amtrack (90 minutes but pricey), Chinatown buses (cheap but scary), or a zipcar. I just did the latter with 4 friends (Melle, Yusef, Yolanda, and Gareth)and it came out to $40 a head each day on the weekend. Gas and EZPass are included. You get to have conversation/dialogue with real people and find out where they are. You get to take on the character of Obama as a community organizer and actively work to make a change. If you go with cool, positive people, you can also just have a great time. 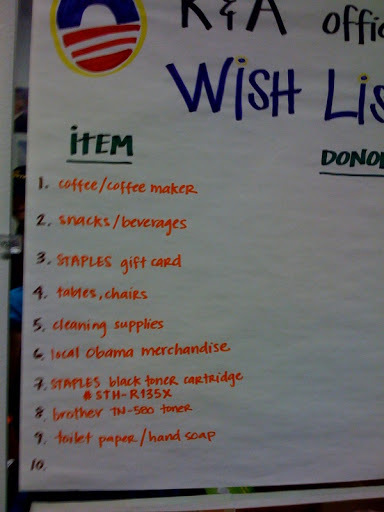 If you can’t go, I’ve posted the real wish list from the office for needed supplies. Folks, it’s just like when you’re producing, creating and performing an indie show and you don’t know how it will come together. BUT IT WILL!! Piece of advice if you hit the ground: take candy as an ice breaker (mini candy bars are a big hit) and Obama buttons (they want them), good arch support and water. When I met a group of people who were mixed about their leanings and I enthusiastically offered a candy bar to anyone definitely voting for Obama, it opened up the conversation in a friendly and playful way. Kids love the buttons and it helps spread the word. You can order some my brother designed or pick others up for buck a pop at the office. THANK YOU!!! The arts/commerce/education/peace/environment you help save may be yours. Oh, other piece of advice: don’t order a “Philly Cheesesteak” in Philly. Just ask for the cheesesteak. Otherwise, you look like a tool. Not that I would have done that at a place called Pat’s in South Philly. That would be ridiculous. Last piece of advice: avoid Geno’s. That’s where the Red People eat their red meat.